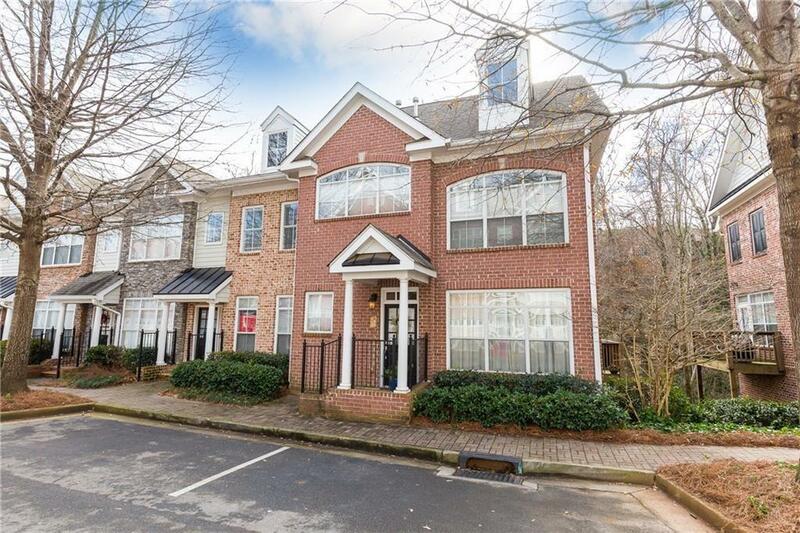 OPEN & BRIGHT 2 BD 2 BTH END UNIT TOWNHOME IN SOUGHT AFTER LOCATION. FINISHED DEN ON LOWER LEVEL CAN BE USED AS 3RD BDRM. GATED COMPLEX. 2 ST LIVING RM, DINING RM, CHEF'S KITCHEN WITH STAINLESS STEEL APPL, GRANITE COUNTERS,TILE BACKSPLASH OPEN TO FAMILY RM W/FPL LUXURIOUS MASTER SUITE W/WALK IN CLOSET, JACUZZI BATH W/TILE SURROUND & SEPARATE SHOWER. SPACIOUS SECONDARY BDRM W/FULL BATH. 2 CAR REAR ENTRY GARAGE, DECK. AMENITIES: GYM, POOL, DOG WALK, BUSINESS CENTER & MORE. Directions: Ga 400 To Glenridge Connector. Head East Towards Peachtree Dunwoody. Entrance To Complex At Light At Glenridge Connector And Peachtree Dunwoody. Go Through Gates To End Unit On Right.